A Little Birdwell Told Me...: I'm a Mommy! Sorry I haven't written anything for the past few weeks...I've had my hands a little full! August 29, 2012- William's arrival! I'm going to give you the Cliff Notes version of the past 3 perfect weeks of my life while our little Munchkin sleeps in his Snugabunny swing! We went to the doctor for the 42 week checkup the morning of August 28th. I still wasn't dilated or effaced at all (for non-medical folks, that means that we were no closer to being in labor than we ever were). We decided together that it was time to be induced, although it was not what I wanted for my first birthing experience. I really wanted to have a natural, drug-free birth without being jump-started by Pitocin. Since my cervix wasn't soft yet, Dr. Brown wanted to give me Cytotec first to get everything ready for the Pitocin to work. I was admitted Tuesday evening at 6:00 and received the first dose of Cytotec at 7:00 p.m. This is not a labor-inducing drug like Pitocin. When Dr. Brown came back at 11:00 p.m. to give me the second dose, he told me he was pleasantly surprised that I was dilated 1 cm and completely effaced! The Cytotec wasn't responsible- my body was sending itself into labor. I couldn't believe it! As the next couple of hours passed, Adam played cards with me while I sat on my birthing ball, breathing through each contraction while we played our game. Around 1:00 a.m., my contractions began to get stronger. The next hour or so was a whirl wind...my water broke on its own and I became 4 cm dilated. About each 30 minutes, I progressed another centimeter. I was scheduled to start Pitocin at 4:00 a.m., but that never happened. By that point, I was 7 cm dilated...and doing great! I stayed focused on Adam and my amazing doula, Beulah Kyle, as they helped me breathe through each round of contractions. Beulah Kyle, the AMAZING doula! Couldn't do it without her! 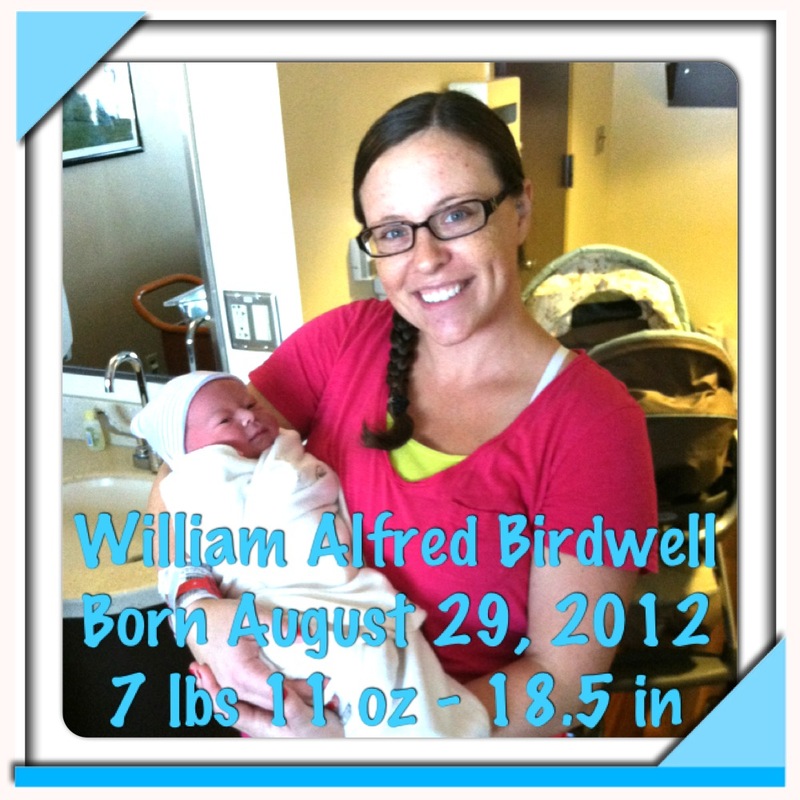 After a few more hours, William Alfred Birdwell was safely brought into the world. 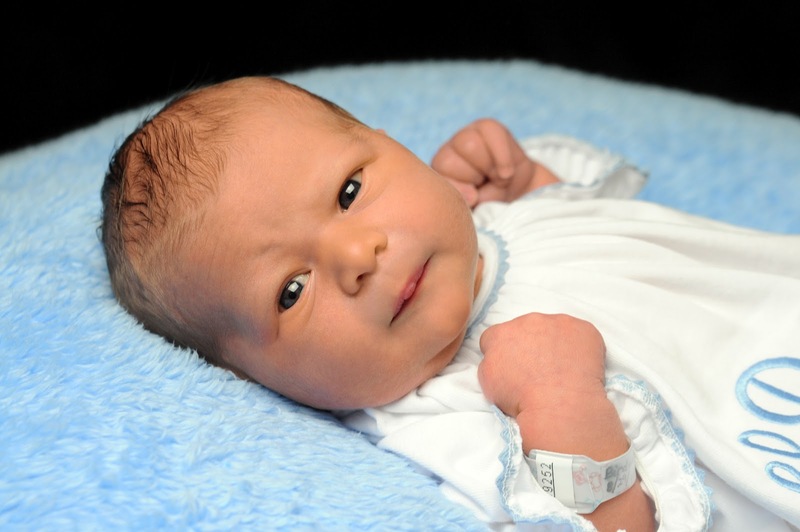 He was born on August 29 at 8:27 a.m. and weighed 7 pounds 11 ounces and was 18.5 inches long. I had the natural, drug-free delivery I had prayed for so fervently. People have asked me how I resisted the urge to have an epidural, and I can honestly say that I had no urge to get one. I prepared for months to have a Hypnobirth, and it provided me with everything I needed to get through it. In fact, most of the delivery was a blur in my memory because I was in my "happy place" through almost all of it. It truly is a "mind over matter" thing, and I fully believe that anyone who sets their mind to having a drug-free birth can totally do it. I went into it with no fears or anxiety, and full trust in God to see me through it till I was holding that sweet baby boy in my arms. I can't wait to do it again...and again...and one more time! I felt amazing immediately after his birth. Everyone who came to visit exclaimed how they couldn't believe I was up and about, bouncing around the hospital room, feeling so good. Speaking of the room, I was a tad bit disappointed that someone beat us to the Predators suite. We did end up getting a Titans suite, though, which came with more square footage, all of Adam's meals included, a refrigerator, and small dining table. We kept William in the room with us for our entire stay. We came home on Friday, August 31st, and have been a blissfully happy family of three. It's funny how life before William seems like a fragment of my imagination- it's as if he's always been in our lives. He is the sweetest, cutest, happiest baby around- and I'm not just saying that because I'm his momma! We've had tons of visitors, and it's always fun to watch them tell us, with a surprised expression, how beautiful and alert our little guy is! Then they go on to tell us about how most newborns look like aliens or simply are not cute, but how that's not the case with William. My heart swells with joy each time I look at our sweet boy. . . I am smitten! His nicknames include "Munchkin" and "Munchkin Man". I have no idea where these came from, but they fit. He is a cute little munchkin! So, what have we been doing since we got home? We have been changing diapers, sterilizing pump parts, figuring out the whole breastfeeding thing, rocking him to sleep, and doing a lot of laundry! Each little coo and grunt he makes melts our hearts all over again, and he sleeps like a champ. While Adam says all of this is credited to our awesomeness as new parents, I give most credit to 1.) William for being such an easygoing baby, and 2.) Babywise. While I haven't taken any books I've read to be 100% the only way to parenting, most of the things we're doing come from that book. I read Happiest Baby on the Block too, which totally has the whole "how to calm your baby" thing nailed! I highly recommend both books. Babywise has taught us how to listen to and assess William's needs to figure out what he is asking us for, and his routine has been smooth to establish thanks to that book. We do an eat-play-sleep pattern throughout the day and it works beautifully. He eats and sleeps like a champ. He takes after Mommy- he's already a book lover! At his one week appointment, he had gained 9.5 ounces since we had been discharged on the 31st. Then he was up to 8 pounds, 4 ounces and 20 7/8 inches long at his 2 week appointment. Our Munchkin is growing like a weed! His pediatrician said we could stop waking him to eat at night, so we've enjoyed the past week of getting 7-9 hours of consecutive sleep! Adam has also enjoyed getting to bottle feed him his last nightly meal before bed time, and I enjoy the break it gives my body (the pump is a little easier on me than William is at times)! Another HUGE help to our transition of being a family of three has been the amazing support group we have in friends, family, and our church family. We're three weeks in and I still haven't had to make a single meal. We've enjoyed yummy home cooked casseroles, salads, desserts, and takeout from our favorite restaurants. . . and all of it has been delivered to us by the warm hands and hearts that prepared it.